Custard is a kind of food prepared with milk and eggs. Custard can be the dessert or its sauce. 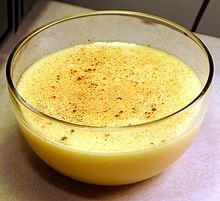 Custard is an important part of dessert recipes from many countries, including the United Kingdom, France, Portugal, Spain, Italy, Australia, and Malaysia. Wikimedia Commons has media related to Custards. This page was last changed on 21 December 2016, at 19:53.